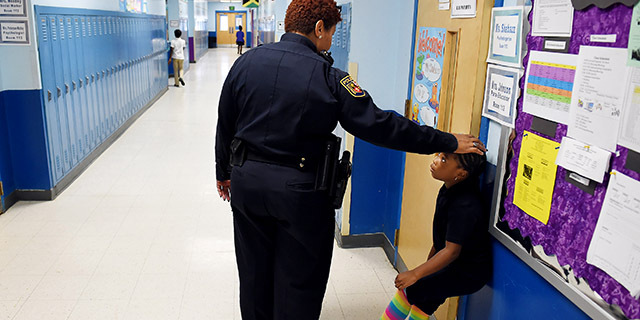 A growing share of public primary schools in the United States have sworn law enforcement officers on site, according to a recent government report that comes amid renewed attention to school security. Few primary schools with officers on site at least once a week reported that officers were at school for all instructional hours every day (13%). In contrast, 85% of primary schools with officers present said these officers were on site at some point during school hours, while smaller majorities said officers were at school when students were arriving or leaving (67%) or at selected school activities, such as science fairs or athletic events (60%). While only 36% of U.S. primary schools had officers on site, the vast majority of those schools (86%) reported that officers routinely carried a firearm. (By comparison, 93% of secondary schools with officers present said officers carried a firearm.) Primary schools in cities were less likely than those in towns and rural areas to report that officers carried a firearm. Across all community types, 32% of primary schools with officers present reported having formalized policies or written documents specifically about officers’ use of firearms. 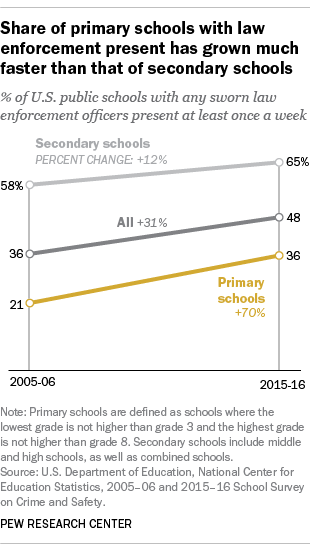 The recent study also found that most primary schools report being prepared for certain crisis scenarios. The vast majority of primary schools overall (91%) had written procedures to be followed in a shooting scenario, up from 76% in 2003-04. Similarly large majorities of primary schools had written procedures for bomb threats or incidents (93%) and natural disasters (96%). Furthermore, large majorities of primary schools conducted lockdown (96%), evacuation (91%) and shelter-in-place (75%) drills during the school year. Regarding general school safety, majorities of primary schools offered training to classroom teachers or aides in safety procedures (93%) and crisis prevention and intervention (72%), according to the report. Abigail Geiger is an associate digital producer and writer for Pew Research Center.